Artificial Disc Market size was valued at USD 1.1 billion in 2017 and is estimated to witness 21.9% CAGR from 2018 to 2024. 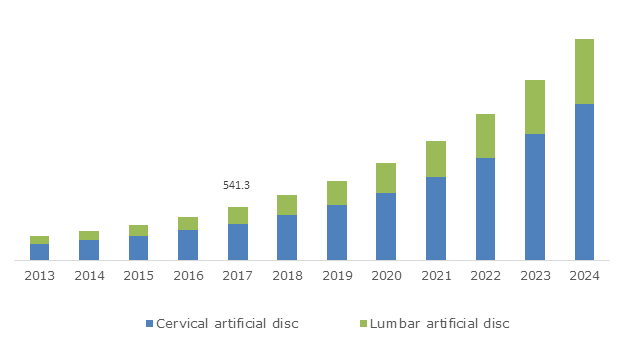 Increasing prevalence of orthopaedic diseases in developed as well as developing economies is the key factor that will drive artificial disc market during the forecast period. Degenerative disc diseases (DDD) are often attributed to upright and bipedal locomotion that exerts mechanical stress on the vertebral column. Degenerative disc diseases are directly co-related with age. High adoption of sedentary lifestyle coupled with increasing number of baby boomers worldwide prone to various musculoskeletal diseases will accelerate the artificial disc market growth. Rising awareness among people regarding benefits of disc replacement procedure over spinal fusion surgeries will further upsurge the industry growth. Rising awareness among people regarding technologically advanced spinal discs coupled with high demand for minimally invasive surgeries will serve to be another key driver that will surge the artificial disc business growth. Development of advanced products such as Mobi-C multi-level artificial disc will fuel its adoption in patients having issues at two consecutive spinal disc. Moreover, cervical-total disc replacement (C-TDR) procedure has proved to be clinically superior in almost all parameters in clinical trial as compared to anterior cervical discectomy and fusion. This will increase adoption of disc replacement surgeries among the patient population, thereby boosting the artificial disc market growth. Cost of total disc replacement procedures is high and therefore unaffordable in the developing economies. Moreover, reimbursement plan for artificial disc varies geographically. Partial reimbursement is provided by Medicare and Medicaid in the U.S. However, countries in the Asia Pacific have no reimbursement plan for such disc replacement surgeries. High out-of-pocket spending required for artificial disc replacement procedures may hamper industry growth in the coming years. Metal-on-biopolymer segment dominated the global artificial disc industry with 91.0% shares in 2017 and is projected to show similar trend during the forecast period. The growth is attributable to the advantages offered by metal-on-biopolymer disc over the metal-on-metal disc such as better biocompatibility, high degree of rotation, flexible movement of spine as well as easy insertion. Industry players are mainly focusing on development of metal-on-biopolymer artificial discs owing to its aforementioned advantages. Rising adoption of such advanced artificial discs for treatment of degenerative disc diseases will accelerate the segmental growth during the forthcoming years. Metal-on-metal segment is expected to witness considerable CAGR of 20.4% over the analysis timeframe. Adoption of metal-on-metal artificial discs is high in developing economies due to its lower cost as compared to the metal-on-biopolymer artificial discs. High cost of procedure and unfair reimbursement in various regions may hamper the demand for artificial discs. 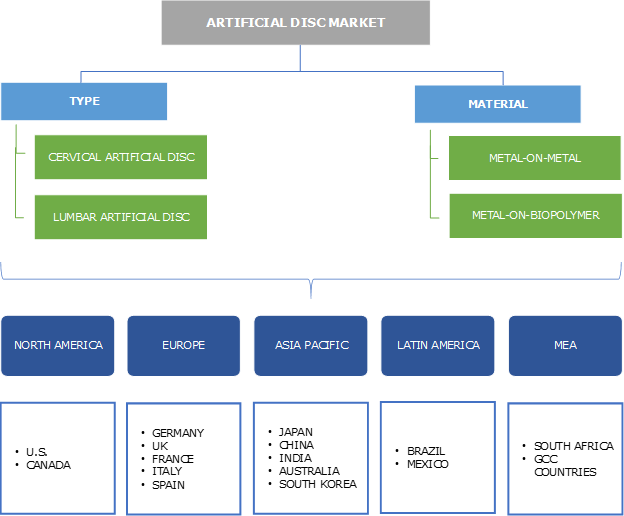 However, rising disposable income leading to increasing affordability as well as developments in healthcare facilities will provide significant growth opportunities to metal-on-metal artificial disc segment in emerging markets. Asia Pacific artificial disc market is expected to witness 24.0% CAGR over the forecast period. Increasing geriatric population base vulnerable to various musculoskeletal diseases such as chronic low back pain will serve to be high impact rendering factor for industry expansion. As per the Economic and Social Commission for Asia and Pacific, around 547 million people aged more than 65 in 2016, and the number is estimated to reach 1.3 billion by 2050. Moreover, increasing treatment affordability, developments in healthcare infrastructure, and growing demand for advanced spine products will boost the Asia Pacific artificial disc industry growth in coming years. Some of the key players operating in artificial disc market are AxioMed, B. Braun Melsungen, DePuy Synthes, Globus Medical, K2M, Medtronic, NuVasive, Orthofix International, Paradigm Spine, Simplify Medical, Spineart SA, Stryker, Synergy Disc Replacement, and Zimmer Biomet Holdings. Industry players are majorly focusing on collaborations, mergers, acquisitions and new product launch to strengthen product portfolio as well as capitalize on market opportunities. For instance, in September 2016, Globus Medical Inc. acquired international operations and distribution channels of Alphatec Holdings, a leading medical device company. The acquisition aimed at expanding the geographical reach and customer base of the company. Artificial disc is a rapidly growing segment of the spinal implants market. The market is well established in developed countries; however, developing countries are still dependent on traditional treatment such as spinal fusion surgery for degenerative disc treatment. Developing economies are projected to show robust growth in the coming years due to increasing healthcare spending and advancement in artificial discs. Cervical artificial disc segment currently represents largest segment in the industry and will witness lucrative growth over the forthcoming years. Industry players are engaged in the development of better products such as multi-level artificial disc to garner higher revenue shares. Developments in existing technologies and growing demand for minimally invasive procedures, artificial disc industry will offer promising growth opportunities in near future.